S.J. Wright, V.E. Centonze, S.A. Stricker, P. Devries, S.W. Paddock, and G. Schatten, An Introduction to Confocal Microscopy and Three-Dimensional Reconstruction. J.J. Art and M.B. Goodman, Rapid Scanning Confocal Microscopy. L. Majlof and P.-O. Forsgren, Confocal Microscopy: Important Considerations for Accurate Imaging. T.C. Brelje, M.W. Weesendorf, and R.L. Sorenson, Multi-Color Laser Scanning Confocal Immunofluorescence Microscopy: Practical Application and Limitations. I. Kurtz and C. Emmons, Measurement of Intracellular pH with a Laser Scanning Confocal Microscope. L.M. Loew, Confocal Microscopy of Potentiometric Fluorescent Dyes. M. Terasaki and L. Jaffe, Imaging the EndoplasmicReticulum in Living Sea Urchin Eggs. A.H. Cornell-Bell, I.R. Otake, K. Sadler, P.G. Thomas, S. Lawrence, K. Olsen, F.R. Gumkowski, J.R. Peterson, and J.D. Jamieson, Membrane Glycolipid Trafficking in Living, Polarized Pancreatic Acinar Cells: Assessment by Confocal Microscopy. D.L. Gard, Confocal Immunofluorescence Microscopy of Microtubules in Amphibian Oocytes and Eggs. R.G. Summers, S.A. Stricker, and R.A. Cameron, Applications of Confocal Microscopy to Studies of Sea Urchin Embryogenesis. J.I. Hale and B. Matsumoto,Resolution of Subcellular Detail in Thick Tissue Sections: Immunohistochemical Preparation and Fluorescence Confocal Microscopy. G.E. Baker and B.E. Reese, Using Confocal Laser Scanning Microscopy to Investigate the Organization and Development of Neuronal Projections Labeled with DiI. J.N. Turner, J.W. Swann, D.H. Szaroski, K.L. Smith, D.O. Carpenter, and M. Fejtl,Three-Dimensional Confocal Light Microscopy of Neurons: Fluorescent and Reflection Stains.Chapter References. Subject Index. Cell Biological Applications of Confocal Microscopy instructs researchers on methods of preparing biological material for confocal microscopy. Individual chapters describe the technical problems of imaging structures in thick specimens and useful techniques such as multi-color dye visualization. 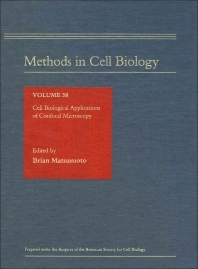 The book provides specific examples of applications of confocal microscopy to cell biological problems. This volume is an essential guide for students and scientists incell biology, neuroscience, and many other areas of biological and biomedical research, as well as research directors and technical staff of microscopy and imaging facilities. New and experienced researchers, graduate students, and technicians in cell and developmental biology, anatomy, pathology, neuroscience, biophysics, optical science. Also large audience in other biological areas for which microscopy is an important research tool, such as directors and technical staff of microscopy and imaging facilities. Neuroscience Research Institute, University of California, Santa Barbara, U.S.A.